The Immoral Minority: While Republicans pretend it is not going to happen Trump's lawyers prepare the groundwork to fire Robert Mueller. While Republicans pretend it is not going to happen Trump's lawyers prepare the groundwork to fire Robert Mueller. The Supreme Court is set to hear a seemingly minor case later this month on the status of administrative judges at the Securities and Exchange Commission, an issue that normally might only draw the interest of those accused of stock fraud. But the dispute turns on the president's power to hire and fire officials throughout the government. 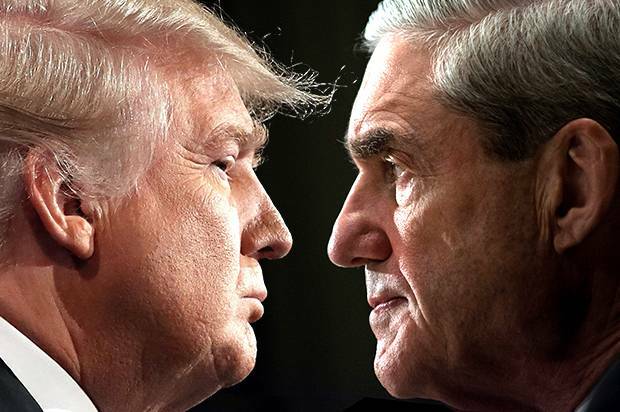 And it comes just as the White House is saying President Trump believes he has the power to fire special counsel Robert S. Mueller III. Trump's Solicitor Gen. Noel Francisco intervened in the SEC case to urge the high court to clarify the president's constitutional power to fire all "officers of the United States" who "exercise significant authority" under the law. "The Constitution gives the president what the framers saw as the traditional means of ensuring accountability: the power to oversee executive officers through removal," he wrote in Lucia vs. SEC. "The president is accordingly authorized under our constitutional system to remove all principal officers, as well as all 'inferior officers' he has appointed." In addition to representing the administration before the Supreme Court, Francisco, a former law clerk for the late Justice Antonin Scalia, could be in line to oversee the Mueller inquiry if Deputy Atty. Gen. Rod Rosenstein is fired. Atty. Gen Jeff Sessions has recused himself from the investigation. Peter Shane, a law professor at the Ohio State University, called Francisco's argument a "radical proposition," and one that goes beyond what is at issue in the case. The justices said they would focus only on how the SEC in-house judges are appointed. But Francisco is asking them to go further and rule on the "removal" issue. "The solicitor general is obviously trying to goad the court into a broad statement about the removability of all officers of the United States," Shane said. "Were the court to make any such statement, it would surely be cited by Trump as backing any move by him to fire Mueller directly." To be clear there really is no other logic reason to do this other than to gain the ability to fire Robert Mueller. This would allow Trump to do that directly, and not have to jump through the hoops of firing Rod Rosenstein and then attempting to hire a replacement that would do the firing for him. And while all of this is happening, we see this response to protecting Mueller from Paul Ryan. I actually think that Ryan KNOWS that Trump is preparing to fire Mueller and that is most of the reason that he is not running for reelection. He knows that once it happens he will get the blame for not protecting the Special Counsel and he will be so vilified that he could not get elected dog catcher in this country. I am convinced Paul Ryan is as corrupt and neck deep in Russian money as Trump is. He's always been a spineless weasel but this refusal to allow a vote is a new low even for his snake's belly. Yes ryan is as corrupt as you imagine. He now wants to go home to his kids and play good. mission accomplished and avoid prison by pardon. Expect another divorce. Lessee... if he fires Mueller before 2 pm, we take to the streets at 5 pm; if he fires him after 2 pm, we take to the streets at noon the next day. That's being bandied around town. And i ain't even on FB, anymore, so it must be like back in the old days. "the rest of Russia’s people, who endorsed Putin’s re-election so impressively? Although the sanctions were directed at Russia’s elite, rank-and-file Russians will suffer as well, because the new measures could threaten Russia’s faltering economic recovery from the sanctions imposed after the 2014 CRIMEan invasion." This particular perversion of democracy goes back to Newt Gingrich: if "our" side doesn't have the votes, then don't allow it to come up for a vote. THAT is how today's Republican Party sees democracy: cheating is OK.
And THAT is why even the smallest abuse of power needs to be challenged WHEN IT HAPPENS. Because, if it is allowed to slide, with time it eventually becomes an unstoppable avalanche. FYI"“Everything that mattered in the Trump Organization, every sizable deal or sensitive transaction, required Greenblatt’s signature, not Cohen’s,” O’Brien reported. He said chief financial officer Allen Weisselberg played a similar role in Trump Organization’s finances. Greenblatt left Trump Organization in December 2016, after the president-elect appointed him special representative for international negotiations." Screw Donald Trump! I want to see the ' ? ' in jail and never to be heard from again. Impeachment is the only answer for the guy - he's a horrible representative for America! Camerota pointed out that the RNC's former finance chair Steve Wynn and top deputy Elliott Broidy were both involved in sexual harassment scandals, while Michael Cohen has been involved with several Trump sexual harassment scandals. “What does this all say about the culture at the RNC?” she asked. Ronna answered with a classic "both sides do it" deflection. Camerota asked several times if Michael Cohen is still on the finance committee. McDaniel finally admitted he's still there, because Ronna believes in "due process. ""C&L wow! Trump screeched "The Silent Majority" during the mob tour. Who are the silent majority? What page in the kgb handbook? Dirt on dirt on dirt. Money and power. rope a dope. the dirty nasty swamp. Starting with the "republican" paid dossier full of juicy tidbits of millions of republican characters, We will silence them with scandal and into submission. bow to trump on your knees. Then Democrats, here buy this dossier full of information on republicans. Oh by the way there are emails of yours in there too. And then from the NRA. Join here, survive the evil world buy guns, bunkers and food. Most Americans grew up trusting, believing and respecting others. Unfortunately there is a deep dirty nasty swamp world beneath our feet full of toxic wasted souls. Some Americans drank the swamp water, some were set up to drink the swamp water and then extorted, bribed, threatened and silenced into submission. They were set up and now used to "deviate" from standard and course of American Lifestyle. They are willing to lie cheat and steal to keep their scandal silent. The Silent Majority of tainted souls, stained souls, corrupt souls, hateful souls, evil souls, deviated souls. They would rather remain silent than confess their secrets for the health of America. The Republicans were bamboozled and have no shame harming America and world. Whose in charge? Mueller Republicans or Trump Republicans? Well it seems right now the RNC and WH are on a anti Comey crusade. Which says more about them, then him since there hasn't been anything we already didn't know in his book. I am done speculating what that nut in the WH is going to do, I think he leaks stuff like this to cause chaos on purpose then does something different. What is Congress going to do about his illegal bombing of Syria? The Republican party morphed into this disaster that they are right before our eyes. Faux news, Rush Limbaugh, Laura Ingram, and Ann Coulter helped that along with their daily barrage of barking down the years. Now we are here. The like of Paul Ryan and McConnell stood by this year with smirks on their face as they watched Donald with his evil magic undo democracy and everything the likes of JFK and Martin Luther King work hard for. Donald basically pulled a Putin and is still working on it and "his" party stands by with unbridled happiness as they watch their Fuhrer and his undoing. Remember, Donald is actually dumb as a rock no matter how much people beef him up. He couldn't have gotten this far without the help of those who stood to gain. That's why he's here. That's why he's boldly going where no president of the United States went is because Donald is confident that the people in power have got his back. But the ultimate backer is that sneaky, behind the scenes Putin. Only history will prove that. Right now people are in complete denial. The brain wants to believe what it wants to believe. All of these decisions are going to be 5-4 in favor of the fascists now that McConnell has put GorSUCKS on the bench. If we lose one more justice, you will have decades of fascist decisions coming out of the Supreme Court. It will be Handmaid's Tale time. Of course it’s going to happen! It’s just a matter of time, probably days. To those who are fearing what the Orange bigot is planning, find a local protest through https://front.moveon.org/. The goal is to have millions on the street asap after the firing. I'll be there. Fairbanks Golden Heart Park. Stay peaceful but LOUD.